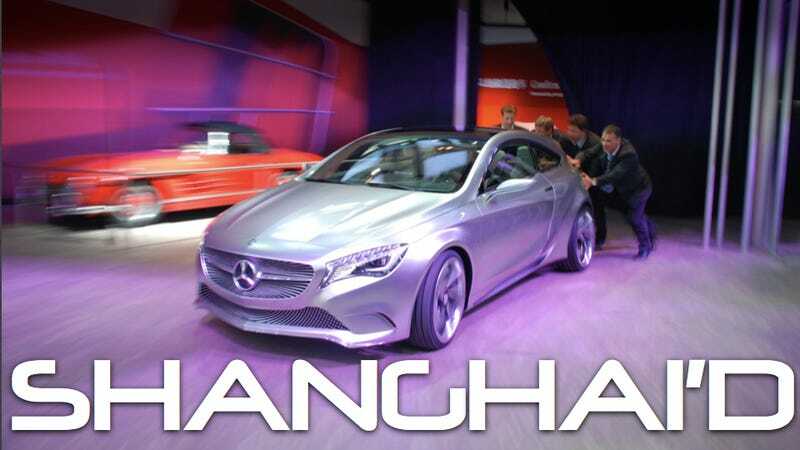 Mercedes had everything they needed today for the debut of the Concept A-Class in Shanghai: Dr. Z, a crappy American rapper, a Chinese movie star, and a working car. Oh, wait, they were missing that last thing. It's a cliche of auto shows that new concepts, no matter how much everyone knows there's likely just a golf cart motor underneath, have to drive on stage. If we can't see something move 20 feet and then spin in place like the world around a Tri-Delt post chugging a sixer of hoarded Four Loko it simply doesn't exist. So it was with much embarrassment that a quartet of suits had to push the fetal bulldog A-Class onto the stage for its big Shanghai debut. At least Car Design News managed to capture the oh-so-important panning shot.